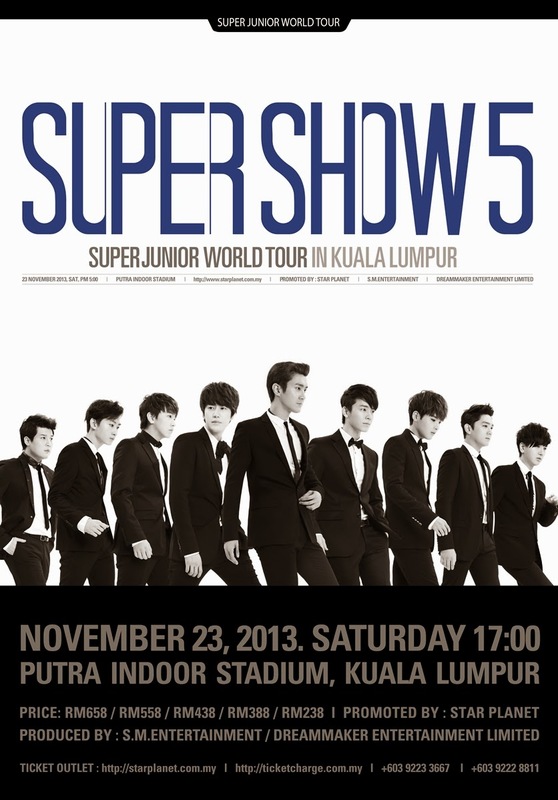 Finally, they confirm will held Super Show 5 in Malaysia!!!!! Just when the Super Junior ELF fans thought that Malaysia is probably fallen out of Super Junior’s “Super Show 5″ World Tour grid, they should be over-thrilled at the fact that the organizer, Star Planet, officially announced today that the much-awaited K-pop super idol boy group will return to Kuala Lumpur to staging their live concert. This time, the organizer is Star Planet. 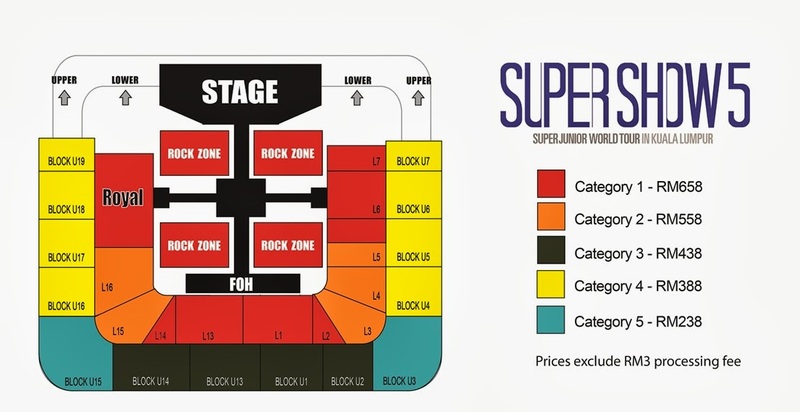 Super Junior will held the concert Super Show 5 Super Junior World Tour 2013 in Kuala Lumpur, Malaysia on 23rd November 2013 (Saturday) at Stadium Putra Indoor, Bukit Jalil. The ticket concert launch on 29th September 2013 (Sunday) at Paradigm Mall, Kelana Jaya; start from 11 am until 7 pm. DISCOUNT PRICE: VALID ONLY ON 29 SEPTEMBER 2013! THIS IS THE NORMAL PRICE AND DISCOUNT PRICE RELEASED BY STAR PLANET. Customers who purchase ticket(s) at the launch venue will receive a 10% OFF on tickets (any ticket type). Each person is entitled to buy a maximum of 6 discounted tickets only. Promotion is valid while stocks last. Customers who call Star Planet +60392233667 or TicketCharge +60392228811 to purchase ticket(s) on 29 September (between 11am - 7pm) will receive a 10% OFF on Rock Zone tickets only. Each person is entitled to buy a maximum of 6 discounted tickets only. Customers who purchase ticket(s) via online booking on 29 September 2013 will receive a 10% OFF on Rock Zone tickets only. Each person is entitled to buy a maximum of 6 discounted tickets only. Internet booking will start at 5pm on 29 September 2013. Customers who present a valid Spritzer receipt (minimum spending of RM10) will receive a 15% OFF on tickets (any ticket type). Every single Spritzer receipt entitles you to one discounted ticket. Promotion is valid only for ticket purchases transacted at Paradigm Mall on 29 September 2013, and limits to 500 tickets only on a first-come-first-served basis. NOTE: No tickets available for sale via ticket outlets until further notice. Good news for who can't queue at Paradigm Mall on this Sunday: MEC Crews will help you guys to buy your ticket based on which ticket category you guys want it. Their can help you guys buy SS5 ticket for all category ticket concert SS5.